One, the "portfolio effect", which reflects past decisions by the company to invest capital in businesses that are now not very profitable. Two, the "business cycle" effect, which captures macroeconomic factors, or at least those that are external to the company. Three, "the management effect", which is the outcome of managerial competence, or lack of it, which determines how effectively the company is taking advantage of the opportunities it has. It is useful to take this concept to the aggregate, economy-wide level as well. We know that economic growth is impacted by the amount an economy invests - that is, how much it adds to its stock of capital. 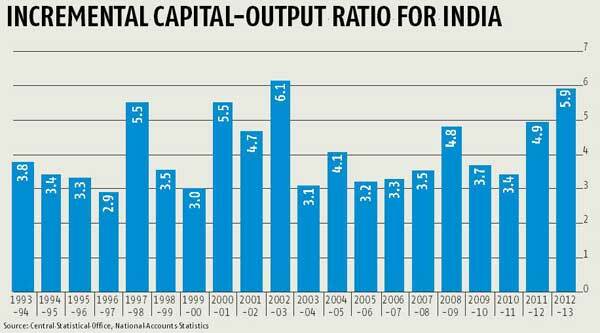 But growth is also influenced by how productively capital is used at the aggregate level. And the outcome is essentially the consequence of the same three sets of factors. Are investments being made in the "right" sectors? Are macroeconomic or sectoral factors allowing capacity to be fully utilised? And are economic managers at all levels acting in ways that lead to capital being used efficiently? Let's look at the episodes during which ICOR spiked. During the three-year period 2000-03, it averaged 5.4. In this period, the average growth rate was about 4.5 per cent, so there was a definite business cycle effect at work, but when we take into account that the investment-GDP ratio was about 24 per cent, it does not appear that the other factors were particularly significant. The relatively low growth rate can be explained in terms of the relatively low investment rate. Evidently, the economy invested substantially more during the most recent slow-growth phase than it had in the previous one, with not much more to show by way of growth. We need to think about the role that the other two factors - portfolio and management - are playing in the current episode of declining capital efficiency. 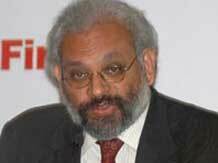 The writer is director of research, Brookings India, and former deputy governor, Reserve Bank of India.